Manufacturing of components for cars, aeroplanes and medical devices is witnessing an industrial revolution of sorts with 3D printing. Three dimensional printing is slated to become the new normal by 2021 when the 3D printing industry in India is expected to cross USD 200 million according to estimates by Indian 3D Printing Network. The Indian 3D Printing Market currently pegged at about Rs 850 crore is growing at about 22% pa and set to become Rs 1500 crore by 2021. In correct technological parlance, the process is referred to as Additive Manufacturing (AM). AM is bringing constructive disruption in the Indian industry, at a scorching pace. Take for example, the Indian Jewellery Industry where 75% of the Jewellery moulds are 3D printed. Smart Tech's Scot Dunham predicts that the global market for direct precious metal 3D printed components and products will grow to $2.6 billion by 2020 and $4.1 billion within ten years in 2024. All of these industry players had come together as part of a Premier Exhibition in Mumbai. 'Inside 3D Printing' Mumbai is India's premium exhibition for Additive Manufacturing (AM). The 4th edition of this expo took place at Nehru Centre, Mumbai, India on 19th & 20th December, 2018. The expo had 30 exhibitors showcasing their 48 brands. Some of the prominent ones included Imaginarium India, HP, 3D System, Shree Rapid Tech, Intech, DMLS, Novabeans, WOL#D, Flashforge, Stratasys, DesignTech, Redington, 3D, Wipro 3 D, Renishaw and Bharat Forge Ltd.
· Manufacturing - Automotive, Aerospace, Tools, Dies and Moulds, Jewellery, Precision Engineering. · Medical - Healthcare, Medical Devices & Dental. · 3D Scanning - Reverse Engineering, Inspection and Tool Room. The Additive Manufacturing (AM) Business Forum concurrently made its debut on 19th December and was an event for knowledge sharing, learning and exploring new career opportunities. It presented applications and business cases by top industry experts from all over the world. The main focus of the AM Business Forum was to offer new market trends, innovations and developments. The topics covered in the seminars will discover the ways to implement additive manufacturing to meet commercial and industrial requirements in different industries. The forum is featuring a diversity of speakers from companies like Danfoss, Renishaw, EWI, Sridevi Tools, Imaginarium, Wipro 3D, Intech DMLS, LHM Germany, Designtech, Additive Industries and Gharda Chemicals, among others. The exhibition was open for Design Heads, Automotive Professionals, Healthcare Professionals, Academicians, Tooling Experts, Architects, Healthcare Professionals, Consumer Goods Designers, Software Developers, Implant Manufacturers and Foundry Owners. 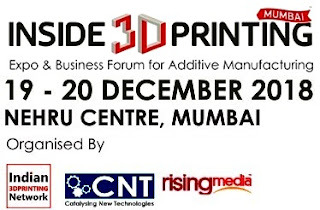 The Inside 3D Printing Mumbai Expo & Business Forum was organized by Indian 3D Printing Network vertical of CNT Exposition and Services LLP (CNT).